Cantabile's audio engine was designed from the ground up to be completely lock-free - a programming technique that's hard to get right, but minimizes the chance of stalls to ensure your gigs are always glitch free. Execution plans are dynamically calculated to optimally spread processing load across multiple cores. Highly performance tuned audio mixers and MIDI processing means more headroom for plugin processing. Cantabile's audio and MIDI routing capabilities let you create dynamically changing setups. The audio engine ensures there are no stuck notes and no audio glitches as routes change. Over 2 years of research and development went into Cantabile's design and implementation. You'll be surprised just how well your PC can perform. At it's core, Cantabile is a host for virtual instrument and effect plugins. Plugins are software components that turn your PC into an infinitely flexible sound and effect module. They don't need to be tuned, don't break down or wear out and don't weigh anything so they won't break your back. Fill your hard drive with gear instead of the back of your van. Even retro 8-bit chiptune synthesizers! If you've tried Cantabile in the past you'll be amazed at what's new in Cantabile 3. From the new audio engine to the stunning new high-res user-interface - everything has been re-imagined, re-designed and re-engineered. Try Cantabile free for 30 days and start building your perfect rig today! Cantabile Performer is absolutely impressive and awesome! Tons of features that are impossible to list. It's the all-in-one total superb solution for my live and studio performances. Cantabile lets you create racks of instruments and effects that can be re-used across songs. Got a particular piano and reverb effect you like to use? Set them up in a rack and re-use that same rack across as many songs as you like. Racks support multiple states so your piano rack might have two states - one for bright and one for mellow. When you're playing live, you can't afford to sit around waiting for your instruments to load. Most DAW's simply aren't designed with this in mind. Cantabile lets you pre-load every song, rack and plugin used by your set list so that switching songs is just that - switching, not loading. And since your plugin racks can be shared across songs, memory usage is completely manageable! This combination of racks and pre-loaded set lists also simplifies song management. Instead of trying to build one giant, inflexible, hard to maintain setup, Cantabile automatically figures out exactly what you need for each gig and loads just those plugins. Cantabile's MIDI routing lets you configure every song exactly as you need it. Setup keyboard splits and change transpose settings on the fly. Get the perfect keyboard response with velocity curves, remap MIDI channels and controllers and route different MIDI streams to different targets. You can even route to external gear and automatically configure that gear with the correct patches and control parameters for each song. You're not just limited to just plugins - you can continue to use your existing gear too. Bloat-free. Awesome for live work. Sub-sessions are a good idea. Masses of MIDI control. For live work, jamming and using as a musical sketchpad, Cantabile Performer is indeed in our top ten. Incorporate audio and MIDI recordings and clips into your performance. Sometimes not everything can be done live - perhaps you've got a background sound effect, or a drum track, or vocal pieces that need to be catered for. Cantabile's media players let you load audio and MIDI clips and trigger them remotely by a MIDI button or perhaps a dedicated note on your keyboard. Media players are also great to play along with while practicing. They support looped ranges, named play ranges and can be timing synchronized. In a live situation you don't want to be fiddling around with on-screen controls. This is why just about everything in Cantabile can be controlled with MIDI bindings. Can't remember the next chord progression? Need to keep an eye on the time? Something else you need to remember? Ditch your hand written notes and stop with the post-it notes. Cantabile's got you covered. You can even configure different notes for different song parts so they update automatically as you progress through the song. Cantabile's auto record features can automatically capture everything you play. The auto recorder can even put your recordings into organized folders, eg: a folder for every month. The ticker bar shows your set list and song parts as a pair of horizontally scrolling lists	. See at an instant where you're up to, what's coming up next and easily jump to a different song. I like that I can be watching a movie or sports or something else: and bang! I get an idea for a song, and I can just start recording, by just playing on my keyboard.... thanks for the great program! Cantabile makes it easy to switch hardware without having to reconfigure every song in your repertoire. By abstracting your hardware behind port names that you define, your songs refer to devices with meaningful names like "Main Keyboard" and "Front Speakers" instead of "PCR-M80" and "Focusrite ASIO". Quickly replace or upgrade a keyboard or audio interface. Just re-map the ports in Cantabile's settings and be ready to go in minutes. Have different configurations for different venues. One for home, one for the studio, and one for the gig - and your songs will just work everywhere. We think Cantabile's user-interface is pretty damn nice. Besides the big features, Cantabile's got plenty of little details you'll also love. Cantabile comes in three editions - which is right for you? Not sure which edition is right for you? Compare Editions. 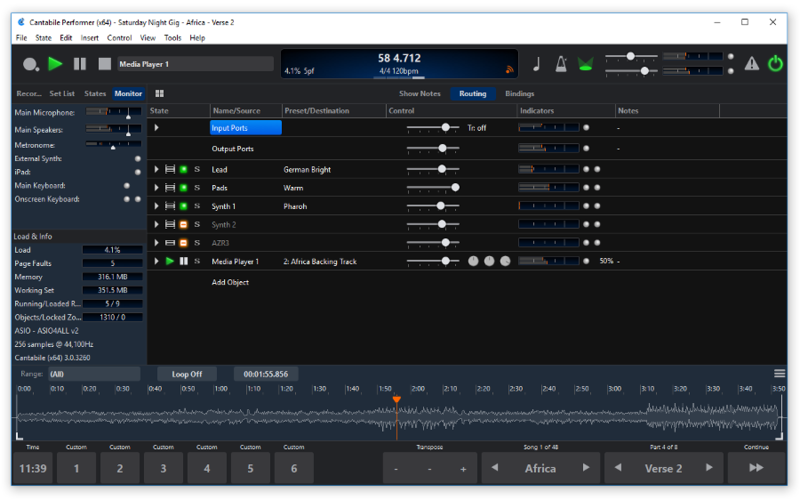 Cantabile includes a state of the art audio engine, rock solid stability, amazing performance, a beautiful user-interface and a carefully chosen and meticulously designed set of features that are perfect for the stage. You also get fast one-on-one email support, walk-through videos and an engaged friendly community forum! Try Cantabile free for 30 days and find the edition that's right for you. Forget about downloads that are hundreds of megabytes. Cantabile's installer is about 6Mb and can be downloaded and installed in a few minutes. This is not by accident! We've put a lot of effort in removing dependencies and keeping things small. We deliberately don't bundle additional software and we don't include any plugins. Also, the installer and all contained software is digitally signed for your protection. When you install Cantabile that's just what you get - Cantabile and nothing else. Cantabile is not your typical music workstation and there will be a bit of a learning curve while you get up to speed. It's not hard, it's just different. To help find your way around there are plenty of ways to get help including online guides, a downloadable PDF, walkthrough videos, fast one-on-one email support and our community forum is a friendly place where you'll find plenty of fellow Cantabile users.